!! OMG, get a haircut, get a job, hippy! 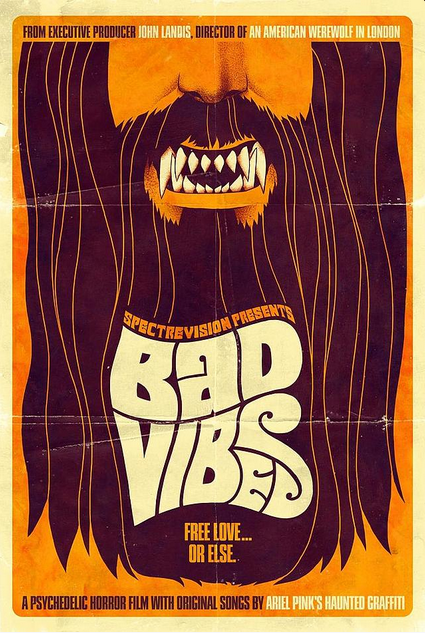 : New poster for Elijah Wood & John Landis’ produced ‘Bad Vibes’ – scored by Ariel Pink !! Elijah Wood is really getting his hands bloody with horror these days. First he starred in 2012’s Maniac and started his very own production company, The Woodshed Horror Company. This year, he and his SpectreVision partners, Daniel Noah and Josh C. Waller, along with new addition, John Landis (Thriller) have teamed up to produced an awesome new 60’s werewolf horror, written and directed by Dave Gebroe (Zombie Honeymoon). The script totally blew me away with its horrifying revisionist take on the Sixties. It’s like a bizarro-world chronology of free love, dark psychedelic music and permissiveness gone hog-wild. My fans will get to hear a side of Ariel Pink’s Haunted Graffiti that no one’s ever heard before, and that couldn’t be more inspiring to me creatively. Check out the new poster above! Bad Vibes is set for a 2014 release. Be the first to comment on "OMG, get a haircut, get a job, hippy! : New poster for Elijah Wood & John Landis’ produced ‘Bad Vibes’ – scored by Ariel Pink"